One of the best Delay and Reverb algorithms in a metal box. Special select 3 classic Delays & 3 classic Reverbs... and we added a bonus “Shimmer” effect which lets you create a dreamy waterfall shimmer. 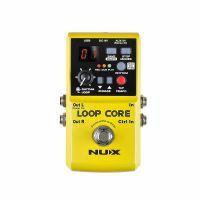 NUX Loop Core allows you to record and create music phases and play back as loops. It has 40 built-in drum patterns and offers you 99 user memories. The New Era of Mic-ing! NUX Solid Studio was created and designed to address: limited gear availability, and the cumbersome transport reality of physical amp/speaker cabinets. 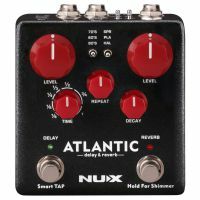 NUX Stageman Floor is an analog acoustic preamp with digital effects and looper function. Preamp featured with a highly sensitive 3-band EQ with MID scoop toggle switch, adjustable notch filter, and input gain control. The wireless microphones and wireless microphone systems aren't anything new, but we guess you haven't seen anything like the NUX B-3 before. Cerberus is a multi-function effect pedal which can be used stand-alone or with the 4 cable method and comes packed with extraordinary features including inside routing, IR loader, analog overdrive & distortion and digital effects. NUX B2 is a digital wireless system designed for maximum compatibility for home or studio rehearsals. NUX B2 passed rigorous testing to achieve the highest signal stability and audio transmission quality hands-down.